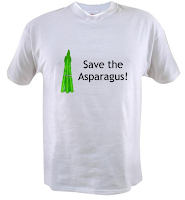 Cort the Sport: Save the Asparagus!! I've been trying to get frozen asparagus at the grocery store for a couple of weeks. At first I figured they were sold out, I mean, this is asparagus we are talking about. Who doesn't like asparagus? Then the last time I read all the labels in the frozen vegetable section and didn't even see a place for asparagus. I got very worried. Today I asked. I was told they were discontinuing asparagus. Yes, DISCONTINUING ASPARAGUS. This is the same store where I could spend two hours in the yogurt section alone with umpteen flavors, fat content, forms (squeeze, blended, fruit on the bottom), quantities, and sizes. I can wash it down with any of maybe 125 kinds of beer (mmm, yogurt and beer!) and then follow that up with one of 150 kinds of crunchy chips/popcorn/pretzels/doodles. So Kroger, you really don't have maybe a cubic foot in your freezer for some asparagus? Are the Hot Pockets and frozen pizzas needing some elbow room? Hypocrites!! They love the stuff, my guess is that the higher ups are hoarding it, keeping it for themselves. I know what you are thinking.....eat seasonal, eat local, eat fresh, freeze your own. 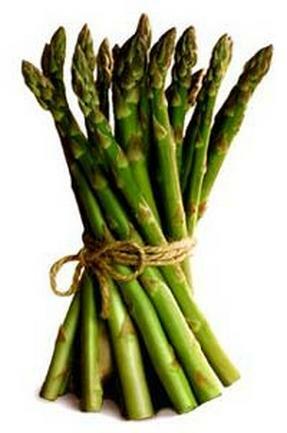 (I even have my own asparagus plants!!) All true. But I still liked knowing that the frozen asparagus was available. A little chicken, a little brown rice, a little flax oil, some salt, and a lotta asparagus...mmmm mmmm good!! It's a sad state of affairs when an entire vegetable is "discontinued". 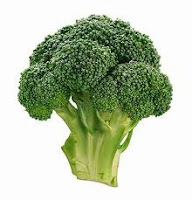 What's next...broccoli?? NOOO! !